"Inspiration is indispensable to my work, but it is hard to come by. It is there or it is not; it is a gift of the gods." 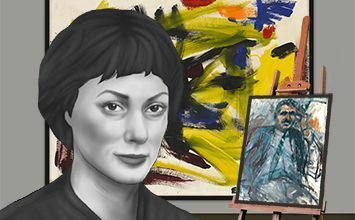 Elaine de Kooning was a prolific artist, art critic, portraitist, and teacher during the height of the Abstract Expressionists era and well beyond. Although her early career was overshadowed by that of Willem de Kooning, her husband, Elaine's artistic range, vast knowledge of media, and influence on fellow artists was undeniable. Many of her so-called pure abstract paintings were produced during the 1950s. Early in her career much of her work was composed of watercolors and still-lifes, and later much of her art fused abstraction with mythology, primitive imagery, and realism. Elaine de Kooning's work continues to receive increasing critical attention as she was, without question, one of the most important art teachers to have worked in the 20th century. While Elaine de Kooning did use gestural brushstrokes in most of her work, much in the tradition of the "action" painters, Elaine's work was figurative and representational, at least to some degree, and her canvases were rarely purely abstract (in the vein of Mark Rothko or Jackson Pollock). As an avid world traveler, de Kooning was exposed to and inspired by a wide variety of art work that helped make her one of the more diverse artists from the Abstract Expressionist movement; she experimented with sculpture, etchings and subject matter inspired by cave drawings, all in addition to her wealth of painting, which included everything from watercolors and still lifes to abstractions and formal portraits. Elaine and Willem de Kooning endured a long and, at times, very tumultuous marriage. As much as each artist benefited from one another's paintings and teachings, they mutually suffered due to constant infidelities and struggles with alcoholism. 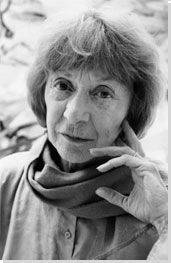 Elaine de Kooning was born Elaine Marie Catherine Fried in 1918 (although she would later claim her birth year was 1920), to Marie and Charles Frank Fried, a plant manager for the Bond Bread Company in Brooklyn, NY. She was the first of four children who were all raised in the Sheepshead Bay neighborhood of Brooklyn. Elaine's younger sister, Marjorie, once recalled that their mother was not the most attentive and loving parent, but she did instill in her children a love for the arts, often taking them to the Metropolitan Museum of Art and to several Broadway shows. In the mid 1940s, Elaine and Willem were poorer than ever, and both were experiencing great difficulty in selling any work. In an effort to make money, de Kooning painted this realist self-portrait and sold it to her sister for a sum of $20, which she described at the time as "good money." The pseudo-abstract touches in this otherwise classical portrait are very much in the style of artist Fairfield Porter, who was a close friend of the de Koonings. This portrait of Fairfield Porter, unlike her earlier self-portrait, indicates a greater sense of gestural abstraction, and even visual elements of what Harold Rosenberg called "Action Painting." Elaine de Kooning evidently took more risks with this portrait by pulling her subject closer into the foreground (confronting Porter's physical vulnerability, in a sense), yet abstracting his face in a similar manner to the surrounding background. The end result is subtly haunting, and is a stunning balance of color and shade. Shortly after receiving her professorship at the University of New Mexico, her friend, poet Margaret Randall, escorted de Kooning to Juarez, Mexico to visit the bullfights. De Kooning was captivated by the movements and colors of her new surroundings. This abstracted portrait of a bull, structured by gestural waves rendered in the warm tones of a desert landscape, was also among some the very first horizontal canvases created by de Kooning. When de Kooning traveled to West Palm Beach, Florida, to paint Kennedy's portrait, she commented that the president was difficult to sketch due to his "extreme restlessness..he read papers, talked on the phone, jotted down notes, crossed and uncrossed his legs, shifted from one arm of the chair to the other.." Upon returning to New York City, de Kooning worked tirelessly for nearly a year, sketching and re-sketching Kennedy based on her original renderings, as well as from hundreds of newspaper clippings and other images. Evidently awed by the task at hand, de Kooning's final product is a lean, vertical portrait with traditional dimensions, her gestural rhythms evoking the restlessness of her subject. During a visit to Paris in 1976, de Kooning saw a 19th-century Bacchus-inspired sculpture in the Jardin du Luxembourg, and upon returning to her temporary studio in Athens, Georgia, she subsequently began a series of large paintings based on Bacchus, the Roman god of wine and intoxication, and often equated with the Greek Dionysus. These paintings marked a brief return for de Kooning to the more traditional vertical canvas, but it was the first time she ever used acrylic paint. In the early 1980s Elaine de Kooning visited a series of Paleolithic caves near Lascaux, France, as well as caves in Spain, Egypt and Kenya. Inspired by what she witnessed inside these caves, de Kooning began her Cave Painting series, which included this 1985 painting. Throughout her career, de Kooning's progression of work was anything but predictable. She often experimented with new materials and varying shades of color and tone, but the one mainstay was her consistent, though subtle, use of abstraction. Cave #54 also reinforces de Kooning's comment that "inspiration is indispensable in my work." In this regard, Elaine de Kooning is one of only a few abstractionists who spoke openly about what directly inspired her work.